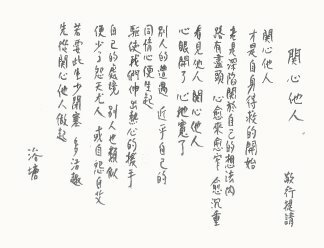 「無我」法印 Dharma Seal on "Absence of Self"
A Praise to Kurukulla by Guru Chen in Calligraphy:As requested by disciple Jing Xing. Chanting Practice for Christians：Introduction to the Prayer of Jesus: a simple but effective spiritual practice originating from Christianity for Christians. Tokens of Gratitude： Jokes spoken by Dr. Yutang Lin to his physician while being treated for Hemorrhoids. Mani Rings： Origination of the making of blessed Mani Rings based on Dr. Yutang Lin's caligraphy of the Six Syllable Mantra of Avalokitesvara. A Brief Introduction to Setting up a Buddhist Altar：A practical guide to setting up a Buddhist altar for lay Buddhists as taught by Yogi Chen. Sky and Ocean：A poem by Dr. Lin. Various aspects of death discussed in the context of Chinese Buddhist Culture.